An island paradise, just over an hour from Brisbane. 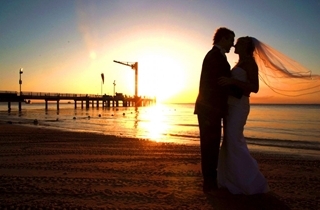 We only book 1 wedding per day, to ensure our team is focused solely on your special day. 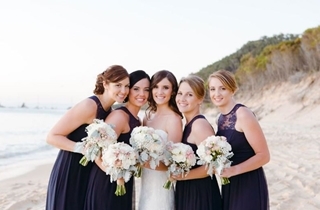 A professional events team and wedding coordinator are always there to help. 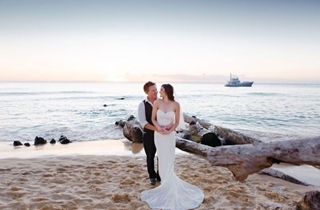 Ceremony on the beach or under the pandanus palms, with the perfect backdrops; the Tangalooma Wrecks or unique sunsets. 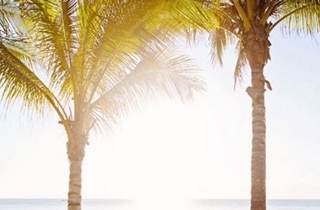 Beachfront and alfresco dining options. 7 styles of accommodation. Enjoy your very own private slice of absolute ocean frontage in Tangaloma's newest premium wedding venue - The Waterfront Pavilion. 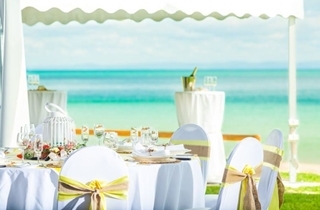 The elegant white marquee-style structure boasts 4 meter ceilings exquisitely styled by Beautiful Beach Weddings. At 30m in length by 15m wide, the air-conditioned Pavilion comfortably seats up to 250 guests. Outdoors, enjoy light breezes in the private garden gazebo, the perfect sanctuary to entertain up to 100 guests with coctails and canapes. Private hire of the Waterfront Pavilion. 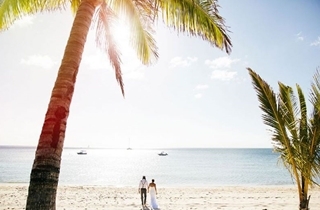 Enjoy your own private slice of absolute ocean frontage in Tangalooma’s premium wedding venue – the Waterfront Pavilion. 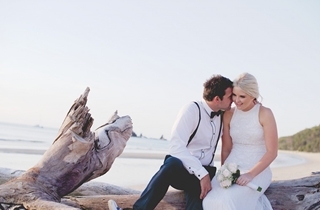 The elegant white marquee-style structure boasts 4 meter ceilings exquisitely styled by Beautiful Beach Weddings. Private gardens for guests to enjoy Moreton Islands spectacular Sunset over the bay. Audio Visual Equipment including use of our TV Projectors. Tables set with crisp White Linen, White Napkins, Cutlery and Glassware. Skirted Bridal Table, Gift Table, Cake Table and Cake Knife. Background music on your CD or iPod. Perfect Island destination with our Wharf Terminal only 10 minutes from Brisbane Airport and 15 minutes from Brisbane CBD. 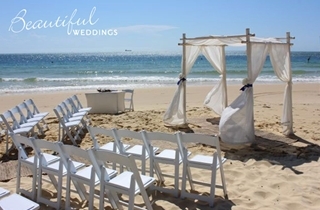 Personalized Wedding Webpage for guests to book Accommodation and Transfers. Your guests will also receive a 20% discount on all Hotel Rooms, Resort Units and Resort Suites when booking through your Wedding Webpage. 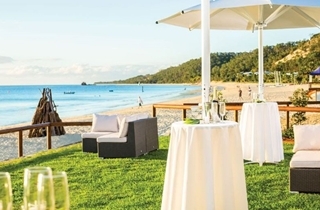 Tangalooma offers a True Island Experience, for you and your guests. Receive complimentary Wild Dolphin Feeding when booking Accommodation through your Wedding Webpage or direct through your Wedding Coordinator. An Appointed Staff Member from Guest Relations to meet and greet guests upon arrival to Tangalooma. 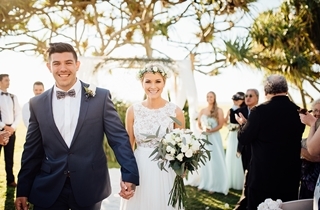 Experienced Guest Relations Manager and Food and Beverage Manager dedicated to your Wedding Reception. 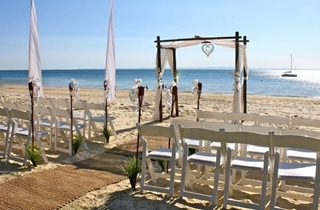 Tangalooma Wedding Coordinator to assist with your Reception Planning. 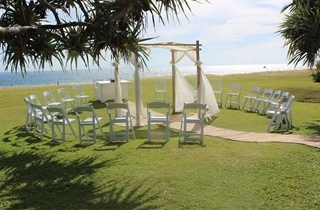 Reception Package must be in conjunction with our Ceremony Package. Minimum 40 guests required. Saturday Night minimum spend $8,000.00 including ceremony.